We need these beneficial buzzers, and they really need our help. UNLESS YOU’VE BEEN wearing noise-cancelling headphones while living under an extremely large rock on a distant planet, you’ve probably heard something about the recent decline of bee populations. The hubbub is completely justifiable, because bees are essential to the health and diversity of our entire ecosystem, not to mention their crucial role as crop pollinators. Much of the attention on the challenges facing bee populations has been focused on honey bees. That’s easy to understand, given the honey bee’s longstanding and well-known relationship with humans, but the problem is actually more widespread. In fact, there are hundreds of native bee species in the Pacific Northwest that also are in peril. Fortunately, it’s easy and fun to get involved in bee conservation. Even though you’ve probably never heard of most of these species, they really could use your help, so why not learn a little bit about them? Before we get into the nitty-gritty of bee conservation, let’s pause to appreciate the remarkable diversity of native bee species. There are at least 4,000 known bee species native to North America, and it is thought that at least 600 of these reside in Washington. If that fact alone doesn’t blow your mind, I don’t know what will. • Plant bee-friendly flowers: Because our goal is to bolster native insects, it’s best to choose native plant species for your landscape. Bees collaborate best with the plants they evolved alongside. In fact, some cultivated horticultural flower varieties have flower shapes that are not even accessible to native bees. If bees can’t get inside the flowers, they can’t eat, which means they can’t pollinate. When planning your bee habitat, be sure to choose several species, so you can extend your blooming season as long as possible. Check out the accompanying resources to find a link to a list of bee-friendly plants. • Provide bee nesting sites: Many species of bees, such as miner bees, sweat bees and bumblebees, live in underground burrows. All they need to build a suitable home is a spot of bare, noncompacted soil. If you have perennial landscaping beds, leave some of the ground free of plants, and use compost rather than bark to mulch your beds. Large chunks of mulch can be difficult for bees to move. The more similar the surface is to a soil-like structure, the better. Other bee species, such as the leafcutter, live in hollowed-out plant stems. This habitat-building project is even easier, because you can just leave portions of pithy shrubs and grasses in place rather than pruning them back every season. Native bees will move into your dead raspberry canes and old hydrangea branches. • Don’t use pesticides: If you needed another reason to go organic in your landscape and garden, this is it. Chemicals designed to kill insects often damage species beyond the intended pest target. A better practice than spraying pesticides is to create a diverse plant habitat. This will attract a range of organisms that can help keep each other’s populations in check. When buying bee-friendly plants this spring, check to make sure the nursery has not been spraying pesticides or herbicides on your selections. As you get to know your bees, you might begin to take pride in the “damage” done by native leafcutters, knowing that you’re providing them with supplies for this season’s nesting brood. • Know your bees: This is probably the most exciting part of bee conservation. The Xerces Society (more on them in a moment) has launched several programs to monitor and track bumblebee populations. If you needed an excuse to get outside and crawl around on the ground this spring, here it is. You can snap photos of your local bumblebees and upload them to the Bumble Bee Watch site. They will be identified by a bee expert and cataloged. As we all know, nothing feels better than contributing to good science. Keeping track of several thousand bee species is no easy task. Much of what we know about native insect populations has been made accessible thanks to the Xerces Society. Poignantly named after the now-extinct Xerces Blue butterfly, this organization is doing amazing work to protect insects of all shapes and sizes. 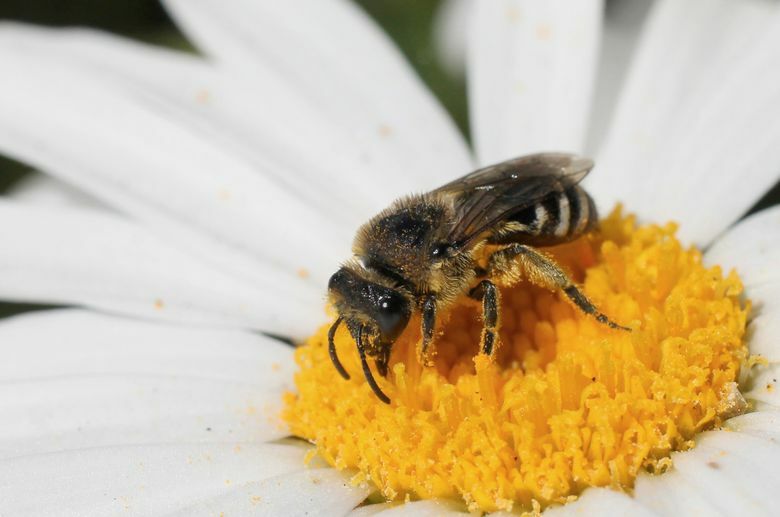 If you want a deep dive into the world of native bees, check out its extensive resources.